In BARBARA, a skilled East German doctor of the same name (Nina Hoss) finds her once promising career more or less finished when she asks to leave the country to be with her West German boyfriend. As punishment, she gets sent to a small town hospital with few resources and plenty of spying eyes making sure she tows the party line. Among those meant to keep Barbara in check is her supervisor at the hospital, André (Ronald Zehrfeld). André's heart isn't really in enforcing the will of the state, though, especially once he meets Barbara and begins to have feelings for her. For her part, Barbara immediately realizes that André is one of her minders, and although she comes to respect him as a physician, she certainly doesn't trust him, never mind return his feelings. She still carries a flame for her West German, who sneaks over the border for fevered trysts in the woods and a hotel. They don't seem to have much in common beyond the sexual, but Barbara nonetheless plans to escape to the west to be with him. However, as she begins to realize that André isn't the simple government stooge he first appeared to be and that there are others in greater need of escape than she is, Barbara is faced with a difficult choice. 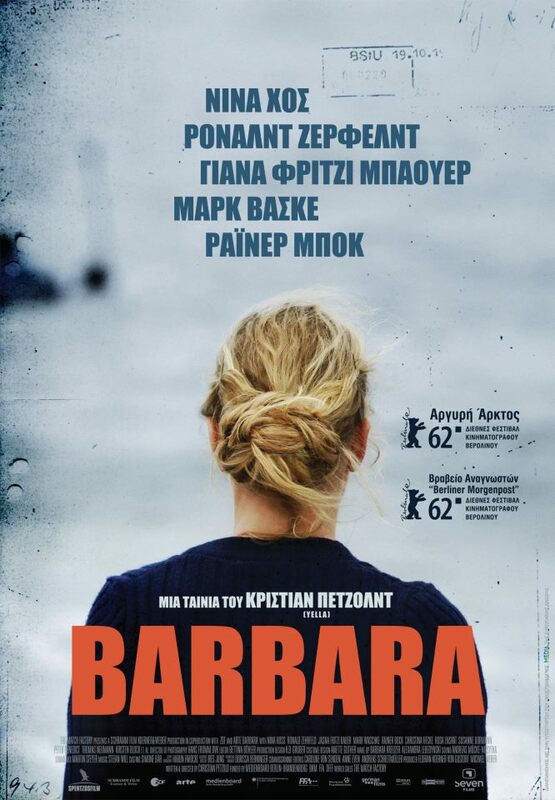 BARBARA is a tightly plotted and directed romantic drama that puts traditional notions of freedom to the test. It seems on the surface that Barbara would be better off in the West than under totalitarian rule, but ultimately we're not so sure. Nina Hoss does an incredible job in the title role, creating a character who at first is frankly not very likable, and in fact seems more than a bit selfish, while Zehrfeld for his part does a good job of channeling a young Donal Logue as the unlikely love interest who won't give up. But BARBARA is never as simple as “will they or won't they”, entwining its potential romance with cold war paranoia, medical drama, and small acts of heroism. Christian Petzold directs the film in a subdued manner. His shots are carefully composed, yet still have some of the rough hewn feel of more documentary style filmmakers like the Dardenne brothers. There is no musical score, but contrary to what was said at this year's Oscar's, the film most definitely does not “just lie there.” It's very much alive, and even without a musical cue telling you how to feel every few minutes, it's a safe bet the emotions will come through loud and clear. 3 1/2 out of 4 stars.